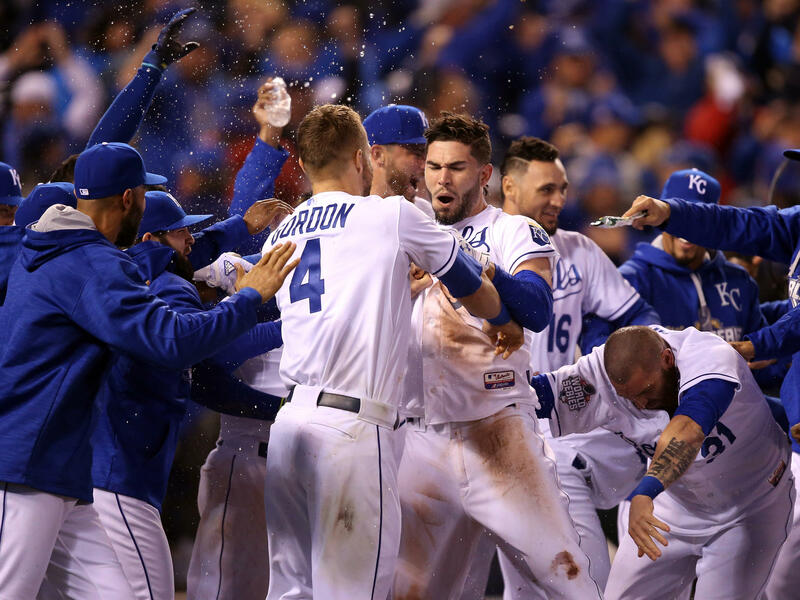 Alex Gordon and Eric Hosmer (center) of the Kansas City Royals celebrate defeating the New York Mets 5-4 in Game One of the 2015 World Series on Tuesday night in Kansas City. 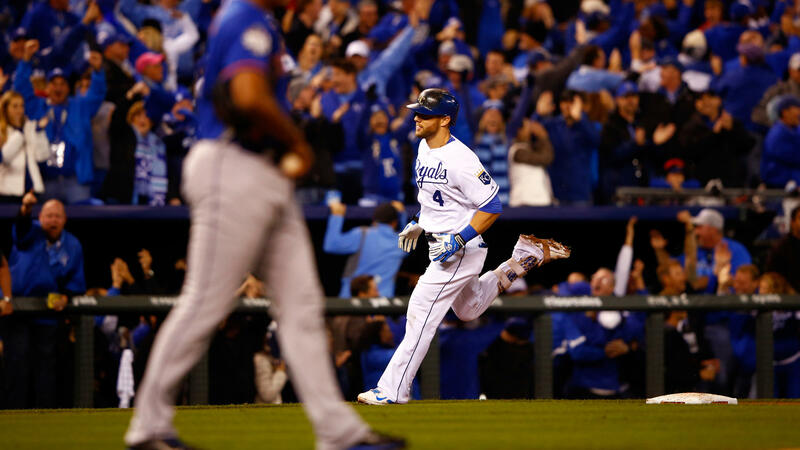 Alex Gordon of the Kansas City Royals runs the bases after hitting a solo home run in the ninth inning Tuesday night, tying the game. 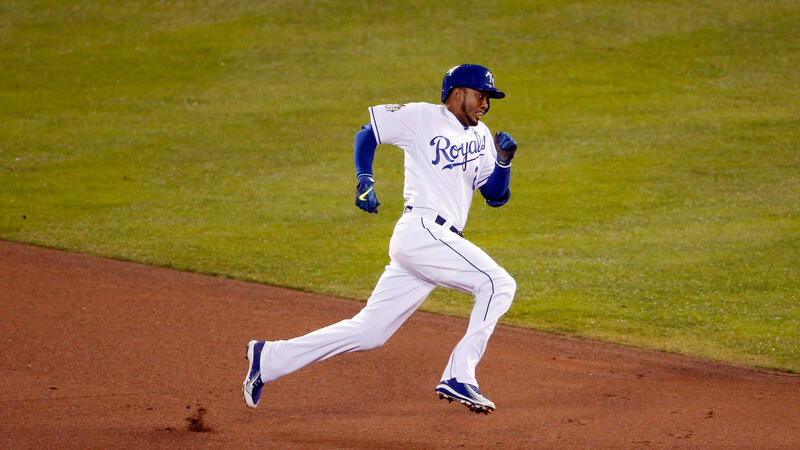 Alcides Escobar of the Kansas City Royals sprints around the bases during an inside-the-park home run in the first inning Tuesday night. Matt Harvey throws a pitch in the first inning against the Kansas City Royals. 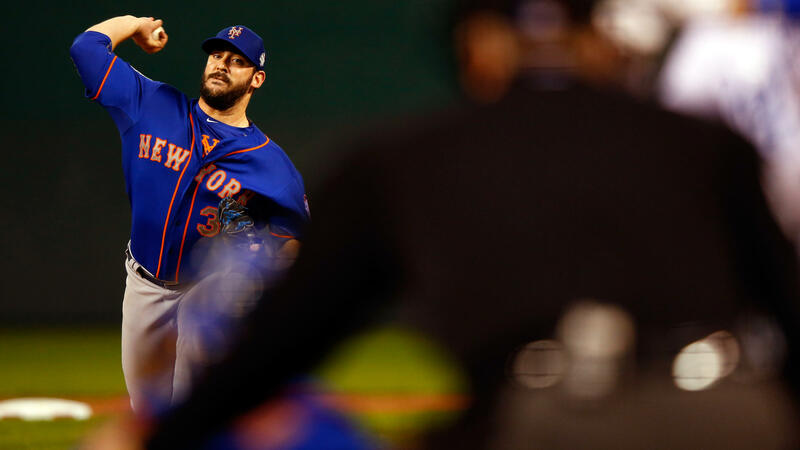 Harvey gave up three runs and struck out two in six innings. 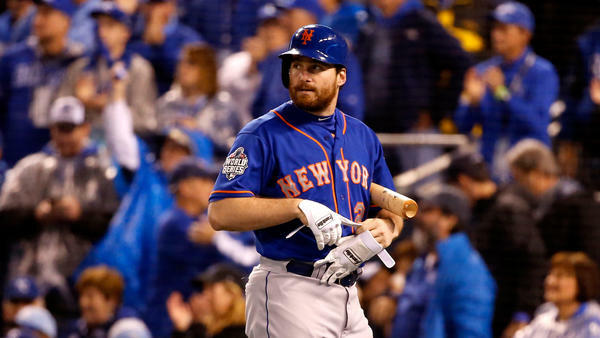 Daniel Murphy of the New York Mets reacts after striking out in the first inning during Game 1 of the World Series at Kauffman Stadium in Kansas City. Final score in favor of the Kansas City Royals, who beat the New York Mets. Number of innings, tied for the longest World Series game ever. One of two other games that went that long was won by Babe Ruth — then a pitcher for the Boston Red Sox — in 1916, ESPN Stats reported. Total number of strikeouts thrown by both teams' relief pitchers — 12 for the Royals, five for the Mets — in the last eight innings of the game. Wade Davis of the Royals struck out the side in the 10th inning, and teammate Chris Young — normally a starter — did the same in the 12th inning. Total fielding errors the Royals have had in this entire postseason. A missed grounder by Eric Hosmer in the eighth inning Tuesday night briefly gave the Mets the lead. Hosmer redeemed himself in the 14th inning when he knocked in the winning run. Career post-season home runs by Alex Gordon, who hit one over the fence in the bottom of the ninth inning to send the game into extra innings. His previous home run came in the 2014 American League Championship Series, which game the Royals a 10th-inning lead against the Baltimore Orioles. Number of seconds it took the Royals' Alcides Escobar to run the 110 meters around the bases on his inside-the-park home run in the first inning. Fast, but not quite Usain Bolt speed (9.58-second 100-meter record). Then again, Bolt gets to run in a straight line. The last year an inside-the-park home run has happened in the World Series. Number of days off Mets starting pitcher Matt Harvey had before Game 1, about double the typical break. Number of home runs hit by Daniel Murphy of the Mets, breaking a six-game streak. He did get two hits and score a run, putting his post-season batting average at .400 — up from .281 in the regular season. The number of times the Fox broadcast had to cut to the studio because of a loss of power to the network's production compound. The blackout also affected replay capabilities within the stadium, which stopped the game for a few minutes. As in p.m. — the time (ET) of tonight's Game 2 of the World Series, broadcast on Fox.